There are lots of myths that surround knights. Many of their stories have turned into legends, and even now, fantasy is its own genre with its own stories. I can hear Excalibur calling. While an author can make up just about any rules for their world if they’re willing to follow them, my stories are loosely based on medieval Europe and Ancient Rome. As such, I do a fair amount of research. 1. Men in armor had to be hoisted into their saddles with a crane. This is absolutely wrong, and people have proven it by wearing period appropriate pieces and mounting a horse without help. My guess is this misconception was started when a scholar lifted armor a knight wore. Possibly a Victorian scholar as they seem to frequently be at the root of historical misconceptions. Either way, it makes no sense for a knight to wear something into battle that would make it cumbersome to get on his horse. Being mounted was one of the tactical advantages a knight brought over a foot soldier. 2. Men in armor struggled to move. 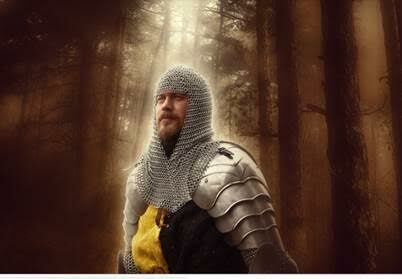 Actually, a trained combatant, particularly a knight, had no trouble wearing and moving in a full suit of armor. An entire suit of “heavy” armor weighed between 45-55 pounds. This is less than a fireman carries with oxygen gear, and less than what most men have been carrying into battle since the nineteenth century. Furthermore, this armor was evenly spread across the body, rather than being concentrated on the chest as most modern gear is. 3. 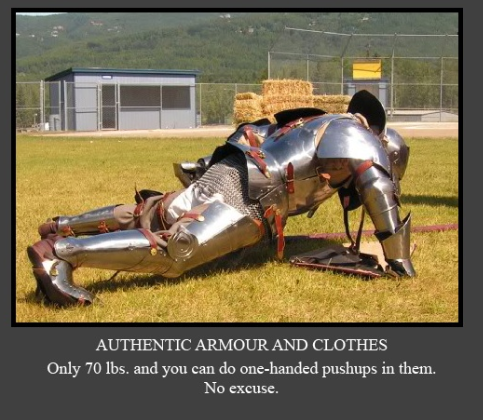 Plate armor made moving even harder. Plate armor didn’t impair movement much at all as it was made up of individual elements for each limb, and each of these were linked by movable rivets and leather straps, allowing for unimpaired movement. A man in full plate armor could run, get up off the ground, and mount his horse without help. To put it in perspective, the French knight Maréchal Boucicault, while in full armor, climbed up the underside of a ladder using only his hands. Men trained most of their lives to become knights. 4. Only knights wore armor. Nope, lots of people wore armor. This was war, and most soldiers had some pieces of armor. It’s quality varied greatly, but even foot soldiers had it and wore it. 5. Only men wore armor. Some interesting stuff is coming out of new grave sites now that we have DNA testing that can use science to prove the occupants are women. 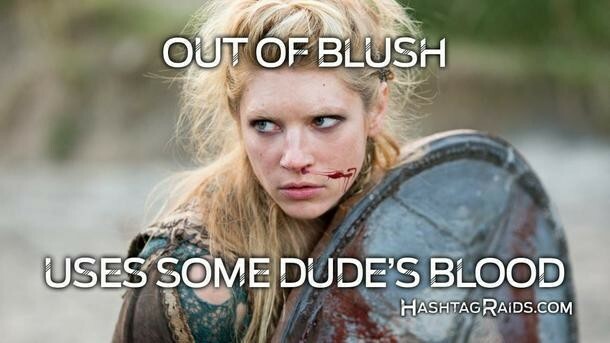 Those shield maiden stories appear to be more than just stories. There is evidence of noble ladies-turned-military commanders, such as Countess Jeanne de Penthièvre (1319–1384). It might not have been common in medieval Europe, but we really don’t know. 6. Armor was so expensive only princes and the very wealthy could afford it. Again, not true. Even a common foot soldier had some armor. This idea may come from the pieces displayed in museums. And while it could be extremely expensive (an entire armory of an English knight was the equivalent to about five to eight years of rent for a London merchant’s house, or over three years’ worth of wages for a skilled laborer), not all pieces were. Some could be had for much less, depending on quality. This also does not consider how much armor was taken from the battlefield. Lots of misconceptions abound, as I learned with swords. Hopefully, this helped clear up a few about armor. Nice job of putting myths to rest. Dang those Victorians and their shoddy historianship!! Great post, as always! They do! We should go back in time and set them straight!